Lib Dem peer Jenny Tonge has been summoned for talks with her leader after saying her party was "probably in the grip" of the pro-Israel lobby. Ms Tonge said: "The pro-Israeli lobby has got its grips on the western world, its financial grips. I think they've probably got a grip on our party." The peer, who has been sacked before for comments on suicide bombers, was speaking at a conference fringe event. Senior Lib Dem officials said they were "deeply disturbed" by the remarks. Norman Lamb, chief of staff to the Lib Dem leaders, said: "We will be seeking a meeting between Jenny, Ming Campbell and Tom McNally, our leader in the Lords, at the earliest opportunity to seek an explanation." Ms Tonge's outburst comes despite the conference overwhelmingly passing a motion on Wednesday condemning the Israeli military action in Lebanon as "disproportionate". And it comes after a group of MPs warned this month that anti-Semitism was on the rise. Jon Benjamin, Chief Executive of the Board of Deputies of British Jews, said the remarks were of exactly the kind of problem identified by the MPs' report. "At a time when anti-Semitism is on the increase everyone should be working to develop communal harmony, I find it despicable that she believed it was appropriate to make comments such as these at a major political conference," he said. 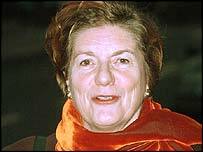 Ms Tonge was sacked from the Lib Dem front bench in January 2004 after saying she would consider becoming a suicide bomber if she was a Palestinian. She insisted she was not condoning suicide attacks. Since then she has retired as an MP but entered the House of Lords. At a conference fringe meeting, she said she stuck by her original remarks. "I said, and I would repeat it now: if I had had to live through that as a Palestinian over decades and I was being given no hope for the future whatsoever I might have considered being a suicide bomber," she said. "I condemn terrorism, whether it comes from bomber pilots dropping bombs on Iraq or Afghanistan or Lebanon or whether it's a suicide bomber. "The suicide bomber is prepared to give his life, the bomber pilot goes home for a beer in the bar afterwards. That is the only difference." Gavin Stollar, a spokesman for the Liberal Democrat Friends of Israel, said: "Jenny Tonge's original support for suicide bombers in Israel got her sacked from the front bench. "I think her vulgar repetition and rhetoric means that her position within the party needs to be seriously reviewed." And Karen Pollock, chief executive of the Holocaust Educational Trust, said: "Jenny Tonge's remarks are based around one of the oldest discredited myths about Jewish people and serve to plant the seeds of racism for others to harvest in justifying acts of anti-Semitism."